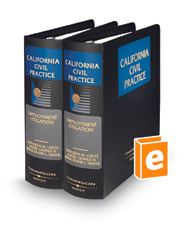 Stay abreast of the most recent information regarding employment law in California with Employment Litigation. Topics covered include preemployment and hiring, wages and hours, and working conditions. Explore statutes and cases regarding discrimination, termination of employment, unemployment and disability insurance, labor unions and collective bargaining, plus employer actions against employees. Procedural checklists help keep your case on track. Extensive bibliographies assist in furthering your research. Forms for drafting complaints and causes of action are also included.